Cedar Art Markets in the Northside of Pittsburgh this summer! Join us for the new Cedar Arts Market in the Allegheny Commons Park East every Second Saturday this summer beginning on June 14th. 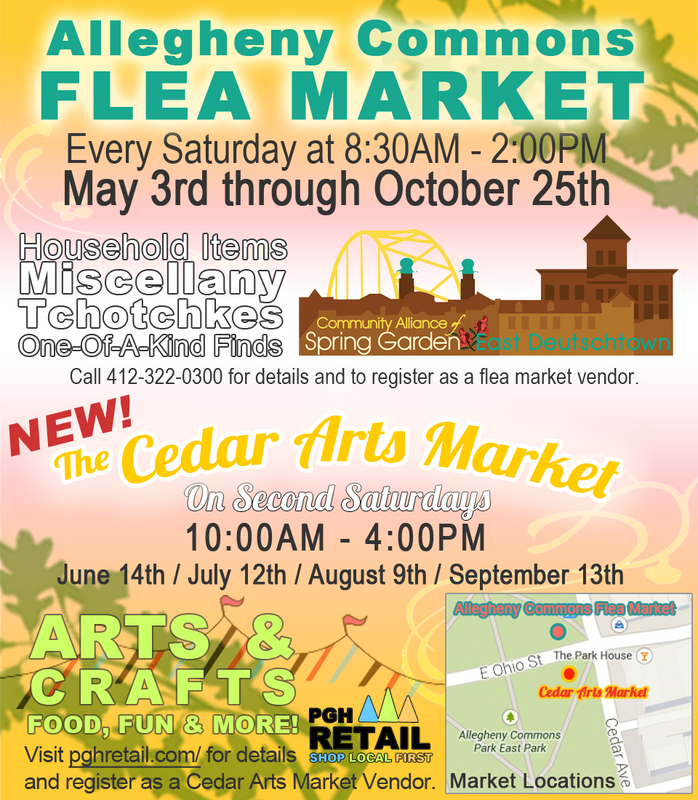 In partnership with the Community Alliance of Spring Garden and East Deutschtown, the Cedar Arts Market will be joining the annual Allegheny Commons Flea Market from 10:00am – 4:oopm. Markets are located on the corners of Cedar Ave. at E Ohio St. at the end of East Deutschtown Business District. Special TRIPLE EVENT on July 12th with the 2nd Annual Deutschtown Music Festival! Check out the Cedar Market page for more details. Interested vendors can apply at the Become A Vendor! page. BBQ & BREW OFF Online Sign-up! It is free to sign-up. You are responsible to purchase all of your food, drink, and sampling materials (plates, cups, napkins) as well as, a table and chair for you to sit on. We recommend bringing your portable charcoal grill, though this is not required. We also recommend considering how best to sample your products, especially the messy ones… err, we mean the, mmm finger-licking good types, so that you have enough to last you through a good portion of the day. We will stop public voting when the first participant runs out or within the third hour of sampling, whichever comes first. So, hit up Tom Friday’s for all the meat you can handle! Vegetarian, Vegan, and RAW BBQ enthusiasts are also invited to sign-up, supply our herbivores some deliciousness, and educate the omnivores about alternative ways of eating. We will make a secondary category if there are more than 3 participants. Participants are prohibited from selling any of their products unless they are appropriately licensed to do so. If you are a licensed food/drink vendor and wish to sell your product, please fill out our vendor form instead. Because alcohol will be available in our designated BBQ & Brew Off area, we are limited in space, so we encourage you to sign-up early and reserve your spot today! We will have a waiting list. All participants need to be confirmed by 7/11 or your space will be given to another. This will be open to a public jury, with honorary judge, Tom Friday, announcing the winners and prizes. Thanks North Side Chronicle! Folks, check our our advert in the next three issues of the NSC and let your friends know it’s free to sign-up for the community activities. Next up, is the BBQ & Brew-off on July 13th. Then August is a Dance & Drum Parade with September bringing down the house with a Family Pageant & Fashion Show. Stay tuned for easy on-line participant sign-up forms! 2 steps to become a vendor! Share the California Markets with friends! Let us know you’re coming and tell your family, friends, and neighbors! Visit a neighborhood that’s unique and hidden up on the North Side while supporting local businesses, makers, farmers, and communities on a Saturday afternoon. These events are free and open to the public so let us know you’ll be there by joining our Facebook Event or through the Eventbrite link below.